According to the Asthma and Allergy Foundation of America, 26 million people have asthma, and allergic asthma is the most common type affecting 60% of sufferers. 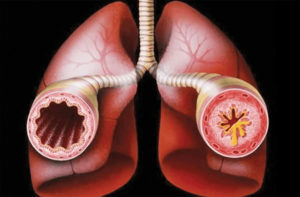 Allergic asthma has the same symptoms as asthma but is the result of what the body is having an allergic reaction to, which causes bronchial inflammation. Allergies can trigger the body’s immune response through skin absorption and contact, inhalation, ingestion, infusions or injections. When a substance enters the body like dust mites (a common allergen), the antibodies, which are proteins bind to the allergen to defend itself. This causes an immunoglobin E (IgE) release. The E stands for Eosinophils. If too much IgE is in the body, it will produce allergic reactions like hives, itching eyes, nasal congestion, vomiting, a swollen mouth or anaphylaxis to name a few. It can also trigger asthma, which is a narrowing of the bronchial system and inflammation of the lungs, which makes it difficult to breathe. Too many eosinophils will trigger a white blood cell response and cause asthmatic wheezing, shortness of breath, coughing and in severe cases, the inability to breathe. To control allergic asthma, the doctor must determine precisely what the allergens are, and treat those, along with managing the patient’s asthma. A blood test can be given to determine how many eosinophils are in the blood and their trigger. Once this is established, to control allergic asthma, certain biologics are preferred by pulmonologists like XOLAIR, FASENRA, and NUCALA. If you or someone you know suffers from allergic asthma, please seek medical treatment as it can save lives. To schedule an appointment with a pulmonary specialist, please call Pulmonary, Critical Care and Sleep Medicine Specialists of SWFL today at (239) 985-1925 or ask your primary care physician refer you to their office. Previous Can the Treatment of your Veins be the Answer to your Pains? Next Do you REALLY Need a Professional to Help You with Medicare?